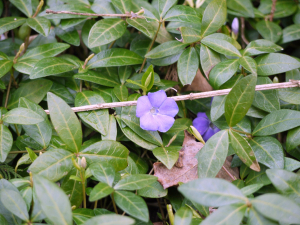 Observation - Lesser Periwinkle - UK and Ireland. Description: This plant is a garden escapee it has crept under the hedge and out on to the road side, flower approx an inch across (25mm). This plant is a garden escapee it has crept under the hedge and out on to the road side, flower approx an inch across (25mm).